For me it has been Lemon. Lemon has a scent that represents smiles, Sunshine and bright blessings. It is good energizing.... I think most all citrus is but lemon is special. 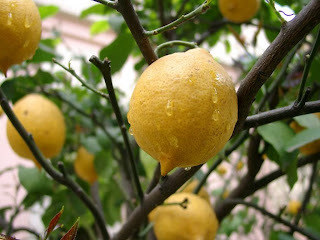 What does Valerie Worwood say about LEMON in Aromatherapy for the Soul aka The Fragrant Heavens? Lemon is vitalizing and purifying to the mind, body and soul. It allows directness and clarity in prayer. Angels often use this vibration to send feelings of happiness and calmness to us, to remind us to use the fertility and richness of the planet correctly.